Okra Soup is one of the most popular draw soups in most part of Nigeria. It is also one of the quickest and easiest Nigerian soups to make. It is globally known as ‘lady fingers’ and very nutritious when combined with pumpkin or spinach leaves. Okra soup ingredients can be obtained from most African Shops. Okra soup is definitely a must try delicacy! These recipe and instructions will show you how to make Nigerian Egusi soup. Okra Soup is one of the most popular draw soups in most part of Nigeria. It is also one of the quickest and easiest Nigerian soups to make. •	Pour red palm oil in an empty pot and heat to dissolve the oil if it is congealed. •	Add the chopped onions (Optional) to fry. •	Add the stock (from the meat and fish) and set on a low heat to simmer. •	Add all the meat and fish, crayfish, pepper bouillon cubes and salt to taste. Then stir well. •	Add the chopped okro and stir well. •	Stir, check seasoning and adjust accordingly (Taste for salt, bouillon cubes and pepper). With most soups and sauces from the West African region, meat and fish are cooked in water and spices to form broth or stock which in turn serve as the base for various soups. To save time, the meat and fish should be cooked prior to the main cooking, so that the soup can be ready in about 20 minutes. • About two hours before preparing the soup, boil the stockfish for 20 minutes and leave in the pot with the hot water to soak. In a separate pot, boil your beef and shaki and the other assorted meats you prefer to use. • Chop the Okra into tiny pieces, the tinier you chop the okra, the more it will draw. (Some African shops sell already chopped okra). • Grind the crayfish and pepper. • Wash your choice of vegetable, and cut into tiny pieces. If you will use frozen spinach, defrost and cut into tiny pieces or buy the fresh spinach and cut to tiny pieces. 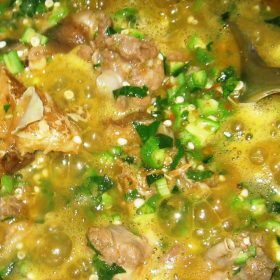 This entry was posted in Nigerian Food and tagged Cook Okra Soup, How to Prepare Okra Soup, Nigerian food, Nigerian Soup, Okra, Okra Soup, Okro, Okro Soup.